(from DaimlerChrysler Press Release) If a Dodge Ram pickup — complete with 500 horsepower courtesy of the Dodge Viper SRT-10 engine — is good, a Viper-powered Ram with four doors is even better. "We knew when we came out with the world's fastest production pickup that there would be customers who would want that same ultimate performance, but in a pickup that offered four-passenger seating and towing capability," said Dan Knott, Director — Street and Racing Technology (SRT). "So, the question was, 'Can we create a more usable truck for the person who wants to haul more stuff, but is not willing to give up performance?' Our answer is the Dodge Ram SRT-10 Quad Cab: a truck that is just as bad and bold in terms of performance, but a little more capable and versatile in terms of hauling." The only logical choice to power the world's ultimate performance four-door pickup: the 8.3-liter Dodge Viper V-10 engine, unleashing 500 horsepower and 525 lb.-ft. of torque. The engine is backed up by a four-speed automatic transmission — a 48RE gearbox, specially adapted from a diesel engine application for its ability to handle monster amounts of torque. A heavy-duty torque converter, custom transmission calibration and two-piece drive shaft were also specifically chosen for overall power-train integrity and performance. 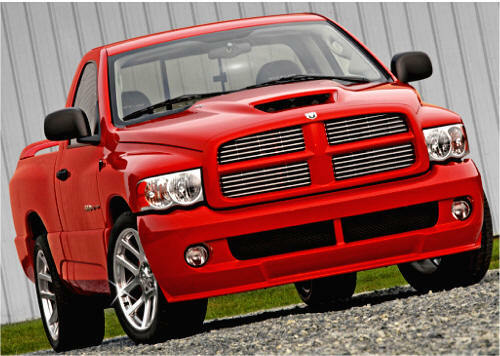 Additionally, the Dodge Ram SRT-10 Quad Cab was fitted with a 4.56 gear ratio to improve launch feel, low-end acceleration and towing capability of up to 7,500 pounds. While brute power and straight-line performance are high on the list of any performance enthusiast, every SRT vehicle must also perform throughout a dynamic range — from neighborhood grocery runs to blasts through twisting and winding roads. To give the Dodge Ram SRT-10 Quad Cab the right balance and poise through a wide variety of driving scenarios, SRT engineers began with a fully hydro-formed frame as the basis for strength and rigidity. 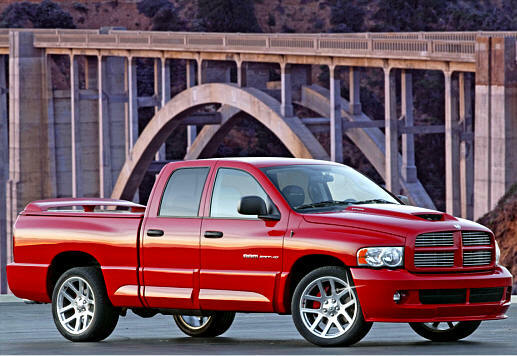 From there, the Ram SRT-10 Quad Cab was fitted with fully-tuned front and rear strut and spring assemblies. Up front, modified steering and independent front suspension carry the load, while in the rear, axle snubbers, performance-tuned springs and Bilstein monotube shocks keep things firmly planted through the corners. Dodge Ram SRT-10 Quad Cab's braking system was designed by SRT engineers, utilizing heavy-duty Dodge Ram components and unique four-pot opposed-piston calipers that are new for 2005. A three channel anti-lock braking system (ABS) actuates new custom red brake calipers up front that grip 15-inch rotors, and in the rear, modified heavy-duty red calipers grip 14-inch rotors. Front brakes are cooled with air ducted from the front fascia to reduce heat build-up. Featuring cues reminiscent of Dodge's NASCAR Craftsman Truck Series Ram — such as the deep front fascia equipped with a wind splitter, signature cross-hair grille and sculpted sides — the Dodge Ram SRT-10 Quad Cab features a unique hood with a fully functional air intake that provides added bay cooling. A body-color aluminum tonneau cover, outfitted with a unique spoiler for aerodynamic balance, is standard. Performance cues inside the Dodge Ram SRT-10 Quad Cab include the Viper-like pushbutton starter, race-inspired, grippy and heavily bolstered seats, a leather-wrapped carbon fiber-patterned steering wheel and brushed metal accents on the instrument panel and door trim panels.